Talk about a case of mixed-up identity! I mean, skin grafts from the buttocks are one thing, but we’re in a whole new frontier of transplanting these days. More frequently than ever, doctors use a technique for treating severed thumbs that works better than trying to reattach a damaged and minimally useful original thumb. Every so often, and most often with men working in the more hands-on occupations, someone loses a thumb. And it turns out, thumbs are particularly hard to re-attach. They are quite intricate and complicated parts of our physiology. The blood vessels are about two millimeters in diameter on average and require sutures about the width of a human hair. Beyond that, bones, tendons, muscles, nerves and all have to be attached in an area much smaller and more densely packed than, say, in one’s arm. Success becomes even more unlikely as time passes and the separated digit begins to degrade. 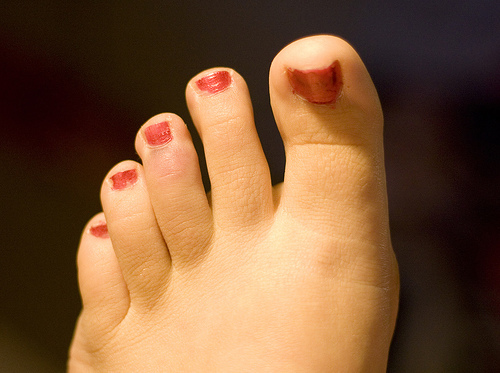 So, innovative doctors came up with a novel idea–just take the person’s big toe and use that as a thumb. It’s a rare enough procedure that when the surgery does happen, it’s usually accompanied by a newscast or two. But there have been enough documented cases to show that this method works quite well–even if the patients seem more satisfied than the doctors. Lafever was just happy to have a thumb, despite the decreased functionality. He even mentioned that aesthetically, most people don’t even notice the difference unless he points out that his left thumb is, in fact, a toe. Even so, plastic surgeons are working on ways of making the toe look more natural on the hand. The procedure requires careful planning. Doctors take detailed angiograms and x-rays of the toe and the area where they plan to attach it, mapping out blood vessel pathways and the bone structure. They also must reconfigure the toe’s tendons to allow for the greater range of motion required from a thumb. The surgery itself can take up to six hours–more if there are special circumstances. Alabama’s Cary Ramey underwent a toe-to-thumb transplant after a car accident. Doctors found unusual arterial structures in Ramey’s toe and the issue added roughly four hours to his surgery. “What about the toe?” you might ask. Walking in flip-flops might become problematic and walking with balance takes a bit of work on the part of the patient, but they seem to prefer two thumbs to two big toes. Over time, the second toe has shown to adapt to the absence of the big toe, compensating for the balance lost. The thumb accounts for around 40 percent of all hand movement and without it, even the simplest tasks that we tend to take for granted become more difficult or even impossible. And while it’s certainly a trade-off, patients are grateful for the opportunity. It’s just one more way that medical science is improving the lives of individuals every day. Kevin Morris is a freelance writer interested in many different topics, including learning about the latest in medical technology. He also writes about companies like CIA Medical, which play a huge part in the world of medicine.